Select, use, and maintain portable fire extinguishers that are appropriate to the hazard. 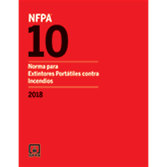 Apply the 2018 Spanish edition of NFPA 10, Standard for Portable Fire Extinguishers. Interested in other Spanish editions of NFPA 10? Use the drop down menu above to select the edition year you need.